Highlights from Democracy Convention 2017! Thank you for all of your support in helping make Democracy Convention 2017 a success! Whether you attended, donated, sponsored, shared information about the Convention or watched a live stream online this year, you helped bring together hundreds of organizers and activists from around the country committed to working across democracy sectors to bring about the system change we envision. In more than 150 sessions across eight conferences and two unique tracks, democracy movement leaders talked about the problems we face, lessons we have learned, strategies for the future and plans for action within a strong, united democracy movement. Even if you were unable to join us this year, please take a moment to give us your thoughts about the Democracy Convention process in a brief survey. Your responses will help us determine next steps and will focus our planning for future Conventions. Please help support the Democracy Convention by donating now! Your donations will help cover outstanding costs from this year’s event, assist us in archiving audio & video content as well as help us get started in the planning process for the next convention. 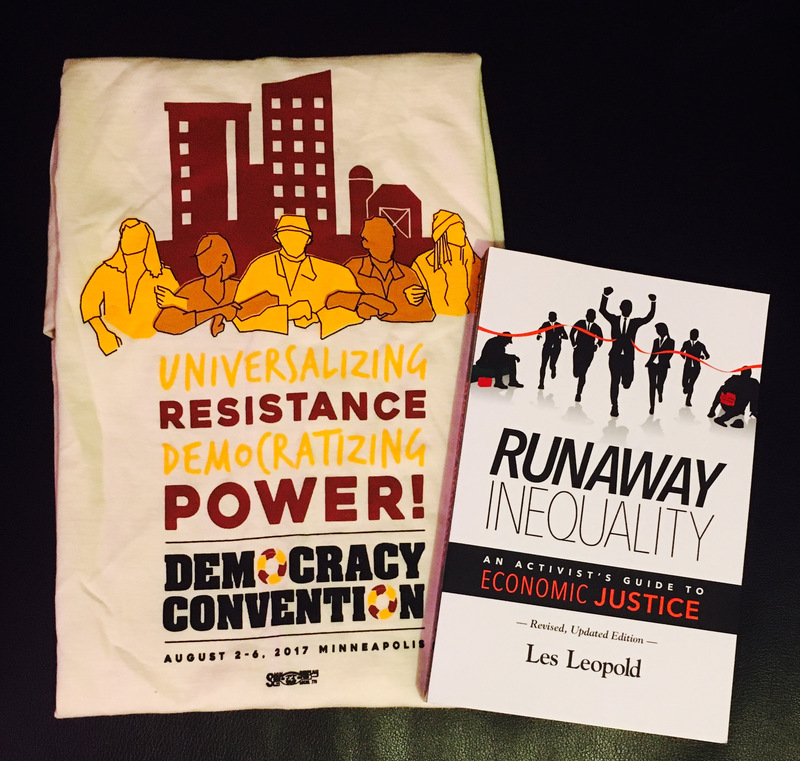 Make a donation for $25 or more and receive a Democracy Convention t-shirt and the book "Runaway Inequality" by Les Leopold (while supplies last). Any amount helps - this is a people-powered project. Thank you in advance for your generous support! *Search the Green News Network Facebook page for videos of convention plenaries, sessions and more from August 2 - August 6. Meleiza Figueroa discusses how Colonization is a more accurate vernacular than racism, and how capitalism classifies people to exploit them at the 2017 Democracy Convention during the Basics of Solidarity & Racial Justice panel. Author and organizer Bruce Berlin's account of Democracy Convention 2017. Don't forget - Support the democracy movement by donating today! Make a donation of $25 or more to have a book and a t-shirt sent to you (while supplies last)! Add your preferred size in the "comments" section. Thank you for your continued support of the democracy movement. The Democracy Convention would not be possible without the commitment of our conference conveners and many generous sponsors!